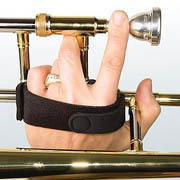 The Neotech Trombone Grip is a semi-permanant handstrap device. Similar to a traditional hand strap, it moves the weight of the instrument from the base of your left thumb to the back of your left hand. Constructed of rigid plastic components with a wide, soft neoprene strap. The semi-permanant installation means the strap is always ready to accept your hand, so that there is much less fuss each time you pick up or put down the horn. The strap portion itself snaps off when you're done playing for ease of storage. The Grip can be adjusted to fit both the instrument and your hand, providing comfort, balance and support. In order to achieve a custom fit for your horn, the Grip comes with three sizes of bushings and several shims. Once the correct bushing type is selected and firmly attached, the hand grip is then snapped into place. It can be adjusted forward and back as well as at a slight angle to create the perfect playing position. The Grip incorporates a soft, durable neoprene strap which closes securely and comfortably across the back of your left hand. It allows for a full range of movement and a comfortable, yet secure hold on the instrument. Fits most trombones. Updated Design now fits Conn 8H, 88H, 62H (all types) and other models with a forward facing gusseted slide brace. Fits small, medium & large bore tenor trombones, plus many bass trombones (some adjustment of the 2nd valve lever may be required in some bass trombone installations). Requires some skill with assembly. If you are a klutz with mechanical things, you will probably want someone who is handy to help you with installation. Click the Learn More button below for installation instructions, detailed photos, diagrams and other useful information.